Are you looking for free printable United States maps? We offer several different United State maps, which are helpful for teaching, learning, reference as well for making business presentations. The following template files can be easily downloaded and work well with almost any printer (PDF). Print as many maps as you want and share them with students, fellow teachers, coworkers, and friends. Teachers can use the map without state names, or the map without capital names, as in-class or homework activities for students. Researching state and capital city names and writing them on the printed maps will help students learn the locations of the states and capitals, how their names are spelled, and associate names with capital cities. The combination of research and writing is a very effective way to help students learn. This research can be done using online or reference book maps. If you are looking to make wonderful slides in Microsoft PowerPoint then you can use Photoshop for all the image editing. Around the Internet, there are awesome free Photoshop templates that you can download. Here is a US Map template with US States that you can download to make awesome slides. 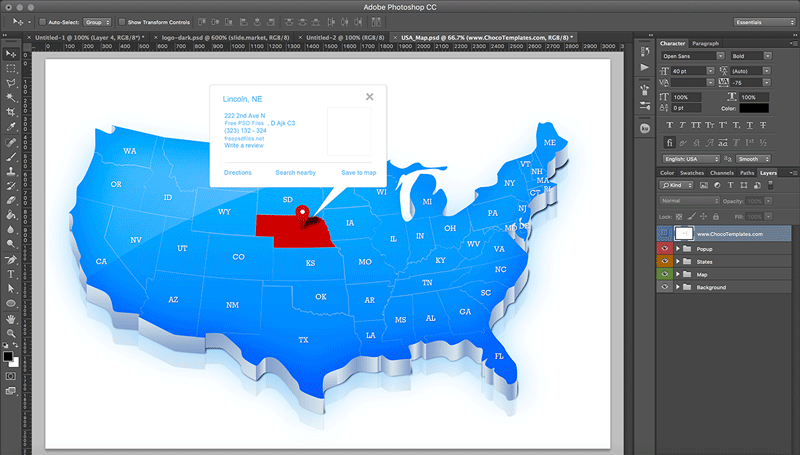 The Photoshop PSD template contains states in different layers so you can easily create popups and highlight any wanted state. US vector maps could be required in some presentations especially if you need to make presentations particular for a US State. For example, let’s imagine that we need to make a California donate car PowerPoint presentation, then a map of California State may be very useful. 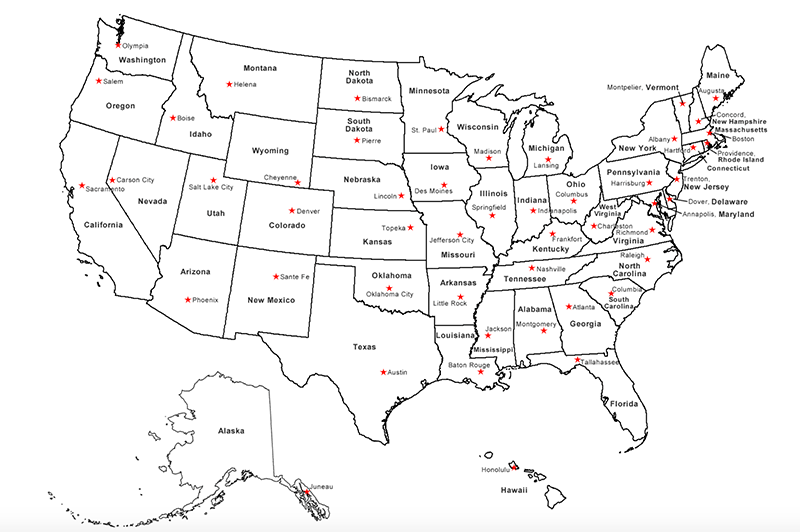 There are other business situations where a US map vector can fit perfectly. Fortunately, there are free sources where we can download map vectors for our presentations. Digital Vector Maps is such resource. In Digital Vector Maps we can find a lot of free US vector maps for our Office documents like Word or Excel, and also for presentations in PowerPoint. The free vector maps are available for free download as map outlines that you can download and use for your slides. There are other maps aside US maps, for example, US States, Map Cities, Otherworld maps, Canada Maps and Globe illustrations. 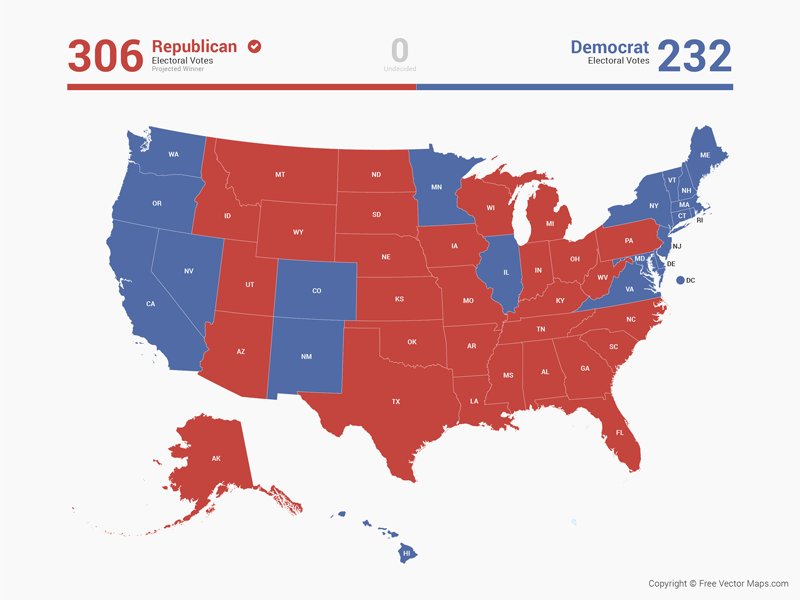 Map of United States Electoral Votes is a fully layered, editable vector map file. All maps come in AI, EPS, PDF, PNG and JPG file formats. Fully editable USA political/electoral vector map of the United States. If you need an editable US Map Template then the following templates are ready to use. 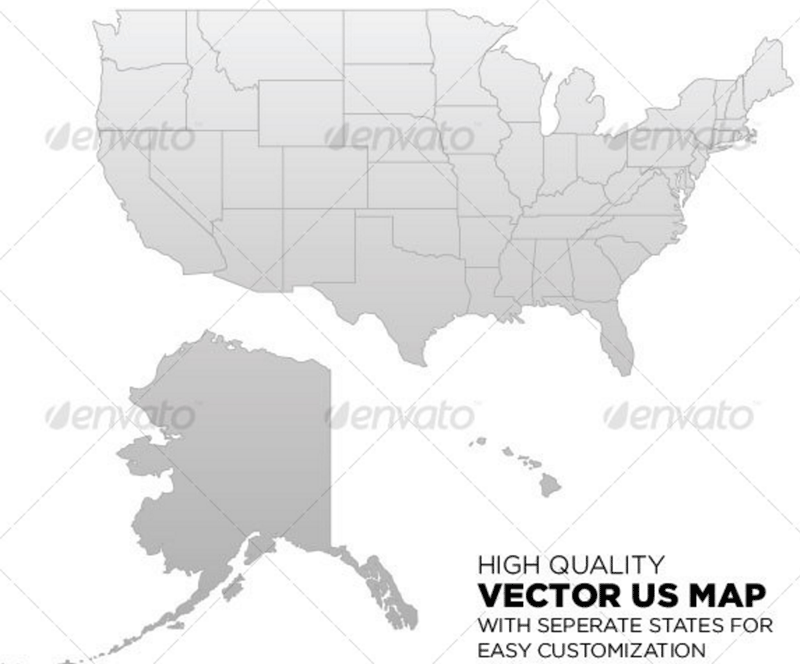 Editable USA Map powerpoint template contains affordable & free-royalty vector shape designs ready for business presentations requiring to show a sales or marketing map of US. 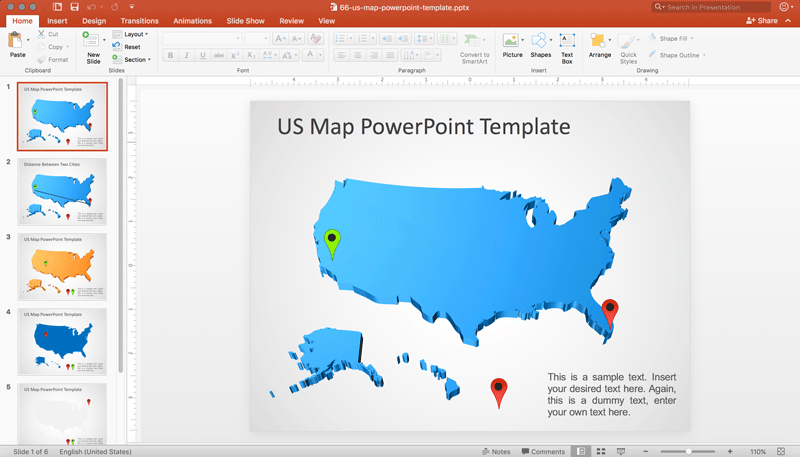 States and regions can be easily customized in PowerPoint. Do you need a simply prepared map that you can print at home, at school, or in the office? Each map can be viewed online, printed, or downloaded. The reference maps display general reference features such as boundaries, cities, capitals, major highways, rivers and lakes, and terrain. Outline maps showing county boundaries, State boundaries, capitals, or other basic features are also available. Maps without labels are included for students and teachers of American geography. The maps are in color, but will also print or copy well in black and white. To make a good infographic, you’ll need a little stats to know that how a little graphic design. Unfortunately, as the format has exploded over the past few years, we’ve seen heaps of work from people who have plenty of the latter but little of the former—beautiful graphics that don’t really tell us much, or, worse yet, obscure the facts. What’s needed is some democratization in the other direction, tools that let people with a good grip on data create visualizations without any proficiency in the Adobe Creative Suite. 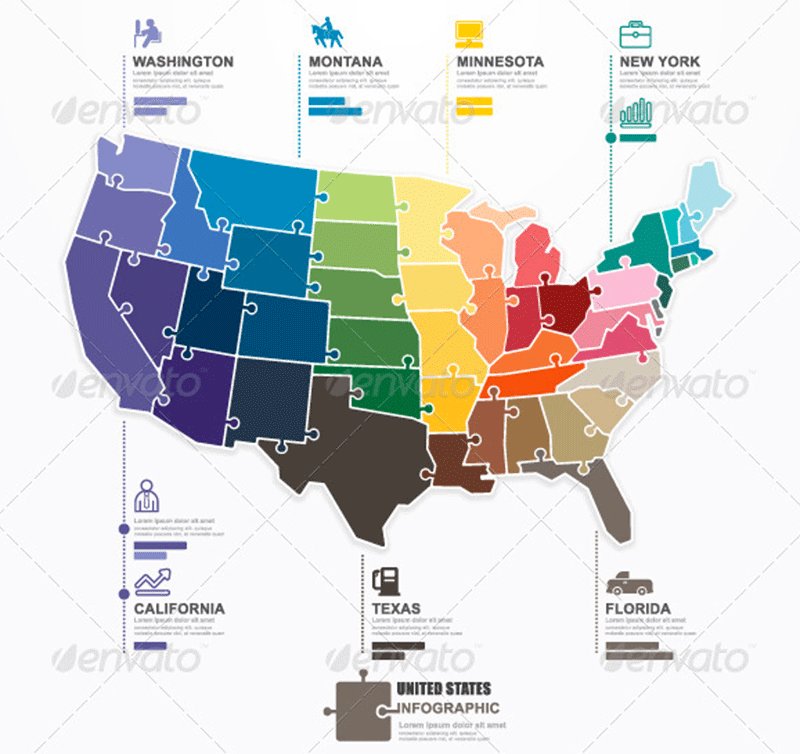 Map of United States of America with Counties is a fully layered, editable vector map file. All maps come in AI, EPS, PDF, PNG and JPG file formats. Each state is on its own layer with counties. County layers are not named. Well organized and color coded 100% vector drawing with separate layers which will help you to illustrate your travel routes or logistics company directions or everything else where you need a map illustration. You can create your own dashed path and use prearranged map pins. In addition, there are stylized landmark icons for each state. This vector graphic template is suitable for motion graphics animation in Adobe After Effects or other animation software. Sweeping all the way across the continent of North America, from the Atlantic Ocean to the Pacific Ocean, the United States is the third largest country in the world, including the non-contiguous states of Alaska and Hawaii. The United States borders Mexico on the south and Canada to the north, and the states on the southeast coast touch the Gulf of Mexico. The United States map shows the US bordering the Atlantic, Pacific, and Arctic oceans, as well as the Gulf of Mexico. Map of USA shows the major rivers and lakes of the US, including the Great Lakes that it shares with Canada. The map of the US shows states, capitals, major cities, rivers, lakes and oceans. A nation established on democratic ideals, cultural plurality, and multiculturalism, the USA is often viewed as an icon of the developed world. Situated in North America, the US is home to many top-ranked metropolitan cities that are known for their infrastructure, civic amenities, and technology. Interactive map of USA also shows the major cities around the country, like New York City, Washington DC, Chicago, Los Angeles, Houston, Minneapolis, Miami, Las Vegas, Nashville, and Pennsylvania. These cities are examples of the diverse cultures around the US and within the major metropolitan areas.